Probably one of the most popular of the exhibition breeds and certainly one of the best suited for showing, silkies are normally found on championship row of the larger shows, and have a history of being a good ladies exhibit (popular with female exhibitors as opposed to only shown by women!) 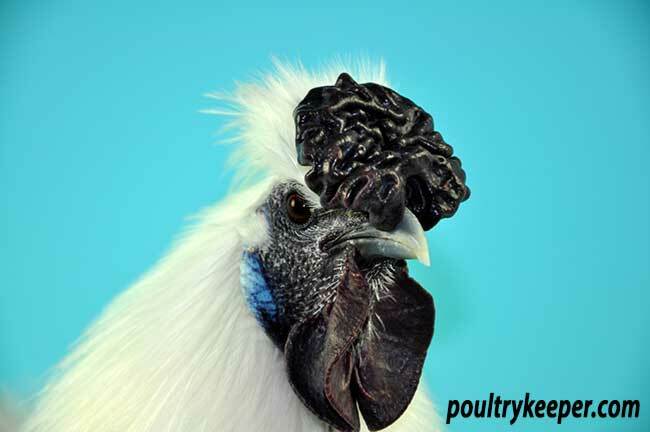 Here is some guidance on exhibiting silkies and the silkie breed standard. Judge Louise Carpenter judging Silkies at the Reading Bantam Show. This is how the bird looks, the features that make it a silkie. It should look broad and stout and the back should be short and rise through to a short, rounded, fluffy tail. The body should be covered in abundant fluff and the wings ragged. There should be a lack of hard feathering, even in the males, where you will sometimes get harder tail feathers (which will be penalised). In the female, the underfluff should nearly touch the ground. The overall shape is cobby and rounded. Large birds should weigh 1.8 kilo (4lb) for males and 1.3 kilos (3lb) for females. In the bantam size, males should be 600g (22oz), females 500g (18oz). There is a bearded type (above) which should have full ear muffling and a beard which covers the lower part of the face with reduced wattles. Remember too that the bird should be alert and lively; a sick or lethargic bird will be disqualified and you may find a note on the cage to see the breed secretary! A feature in its own right, the head should be short and neat, and topped with a pompom like a powder puff which in the male will have shiny ‘streamer’ feathers pointing backwards. The crest should not obscure the eyes. The beak should be a slate grey (black in a black bird), short and neat and complimented by black eyes. Head of a white Silkie female owned by David Pell showing the walnut comb. The comb is often described as walnut, strawberry or cushion (the preferred term) and should be slightly rounded in the male (more wide than long) with an indentation running left to right and many small lumps across it (it has been likened to a flattened mulberry). In the female the comb should be very small and hidden by the crest (although the comb should not split the crest). 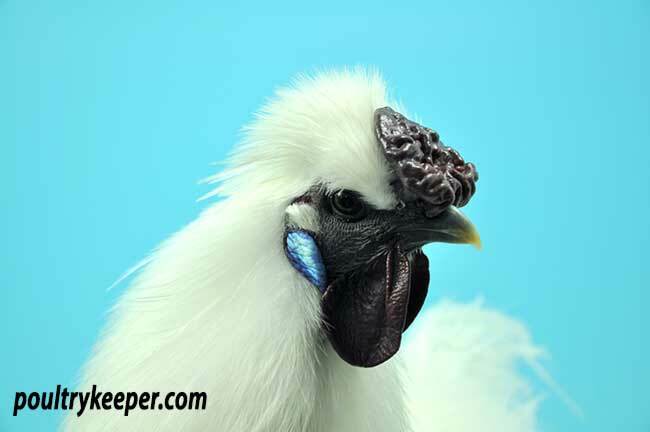 Head of a white Silkie male owned by David Pell showing the walnut comb. The comb should not be of the single type. The ears should be small and neat and preference is normally given to turquoise blue ear lobes, although mulberry lobes are permitted. The wattles in the male are small and neat, and a dark mulberry colour. In the female they should be nearly absent and black. The face should be black in both sexes, tending to a deep mulberry in the male. The legs should be short and wide set but not bowed. They should be well fluffed at the thigh and moderately feathered along the shank (no hard feathers). The toes, which are also feathered, should be 5 in number, with the fifth toe coming off of the fourth. Pincer toes (like a crab claw) are a fault. Each toe should have a full nail. Legs and feet should be a dark slate colour. Black birds should be even although a small amount of colour is permissible in the hackle but not desirable. Blue birds should be an even colour, no patchiness or splashing. Secondaries (outer web) dark orange, (inner web) black. Tail and sickles, leg feathers and breast black. In all colours the skin should be dark, almost black. White Silkie Male at Reading Bantam Show 2015 owned by Kirsten Mitchell. 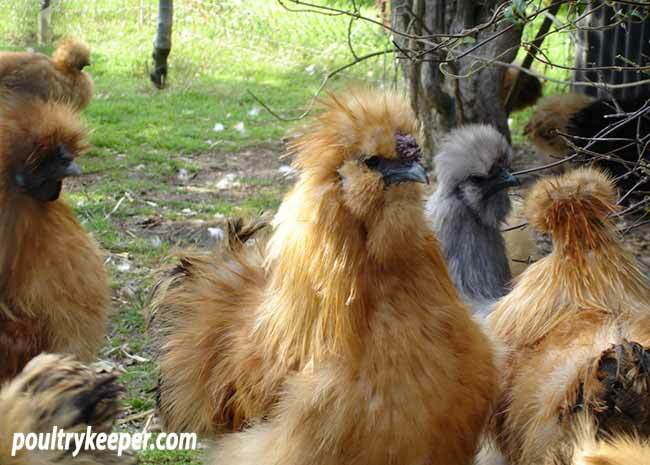 There are more photos of Silkies on our breed page here. This is what makes the silkie a silkie! It should be silky and fluffy with hair-like feathers throughout. The feathers should be profuse and thick, and cover the thighs, run down the shanks and cover the middle and outer toes. There should be an absence of hard feathering. The wings are describes as ‘osprey’ feathered which can confuse people; the wings should certainly not be like those of an osprey – they should be ragged with some of the flight feathers hanging loosely down, almost tattered.